On Yao’s 33rd birthday three days ago (September 12th), Dime Magazine took us back to the good ol’ days by recapping Yao’s Top 10 NBA Moments. Although I would have a couple of other games in there, they do a great job describing many of them, as well as including video clips from some of his best games. Watching these videos really helps you remember how dominant Yao was. Enjoy! 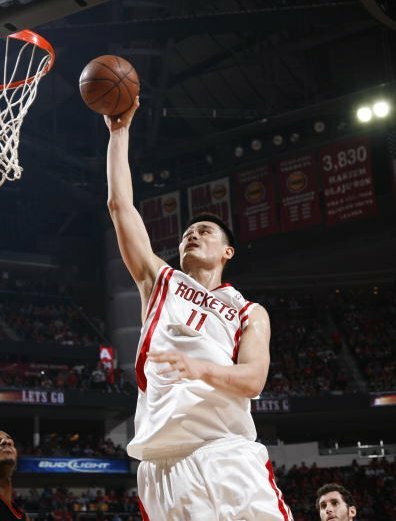 Yao Ming scores two of his 28 points (12-of-17 shooting) Saturday night in Houston against the Atlanta Hawks. Houston beat the Hawks easily, at one time holding a 33-point lead. The Rockets have won 6 in a row to get their record to 30-20 and are in the thick of the hunt for a playoff spot. Click here for more photos from the game. Coming into Houston on Saturday, the Atlanta Hawks were on the second night of a back-to-back (losing at home to Cleveland the night before), and had lost 9 of their last 10 road games. But the Rockets showed no sympathy by playing one of their most complete games of the season, drilling the Hawks 108-89 to win their 6th game in a row and go 30-20 for the season. After the Rockets were a mediocre 13-15 just 7 weeks ago, it’s getting really interesting in Houston these days. The Rockets had 29 assists against Cleveland on Thursday, and Saturday night they racked up a season-high 32 dimes while scoring 44 field goals and shooting 54.3% from the field. They shared the ball so well and had guys cutting to the basket for easy shot attempts, it reminded me a lot of the Sacramento Kings during their heyday under Rick Adelman. Or dare I say it, the Spurs during their championship runs. It’s very rare when a team achieves that level of chemistry where the Rockets get as many assists as they’ve had the past two games. I remember back in 1994 and 1995 when the Rockets won their championships, a lot of it was the result of unselfish basketball like what we’re seeing now. It’s still early yet, but if the Rockets keep this up, it going to start getting really fun in H-town. 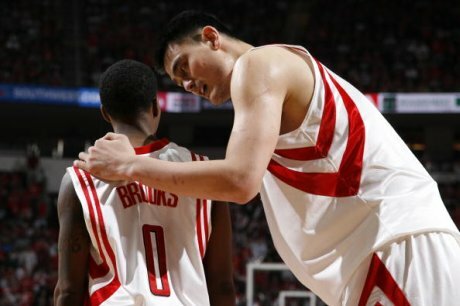 While everyone was passing the ball, Yao Ming was being his dominant self by scoring 28 points on 12-of-17 shooting (10 in a row at one point), 4-of-4 from the line, and blocking 2 shots. He also had 3 assists to join the passing party. The Hawks had no answer to the Big Man, either down low where he scored multiple times with left-handed jump hooks off the glass (he seems to really have perfected that shot). And they could only watch in awe as he hit two long jumpers from the top of the key to finally break his shooting slump from out there. And did you see that play where Yao got the ball behind the 3-point line, then dribbled it a couple of times toward the basket taking giants steps to get all the way to the basket for a layup attempt? Although he missed the shot, it showed yet another move in his arsenal that has to keep opposing defenses guessing. 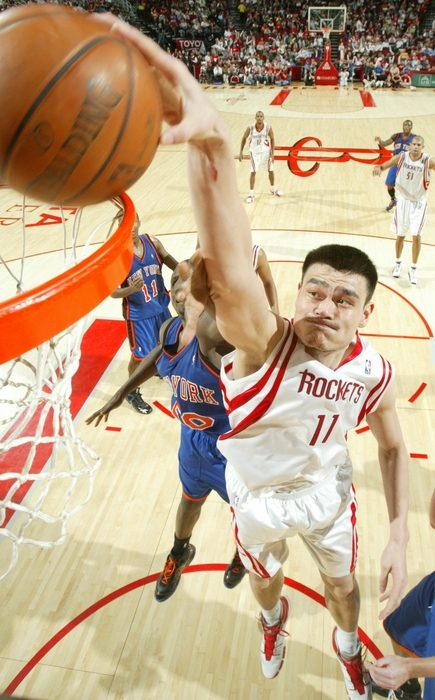 Yao Ming had a monster game against Al Harrington and the Golden State Warriors, scoring 36 points and grabbing 19 boards to lead the Rockets to a very surprising 111-107 victory. Click here for more phots from the game. I was absolutely astounded with what I saw Tuesday night as I watched the Rockets upset the Warriors 111-107, in my mind probably the biggest upset of the season for the Rockets, even if it was a home game. Here are the reasons why I am very surprised with this victory. The Warriors are absolutely loaded offensively, scary to play because you’re never safe no matter how big of a lead you may build, and they have had the Rockets’ number in their first two matchups this season with the Warriors winning both games easily. Every game right now means something to the Warriors, too, as the Rockets and other teams are not too far behind them in the playoff race. The Rockets started off giving the Warriors a taste of their own medicine, coming out running-and-gunning and opening up a 20-point lead at one time in the first quarter! However, you just knew that kind of lead wasn’t going to last because the Warriors are so explosive. It’s no surprise the Rockets would get away from moving the ball and doing the things that got them their big lead, which let the Warriors back into the game when so they could make their much anticipated run. Ironically, it wasn’t the Rockets getting back to that faster style of play that won them this game. It was the plodding, old JVG-style of halfcourt basketball where one guy (guess who) posts up and wills his way to get a shot off, or gets fouled to go to the free throw line. Not as beautiful as moving the ball around to find the open man to take a shot, but still very effective. 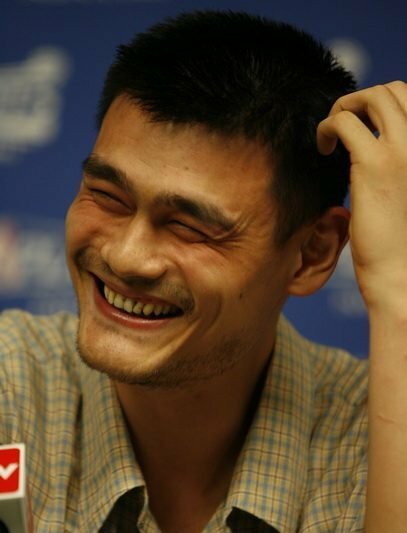 After only averaging 13 points and taking 20 shots in both games against the Warriors this season, Yao Ming was a beast against the undersized Warriors, scoring 36 points on 11-of-19 shooting and 14-of-15 from the line, while also grabbing 19 boards. 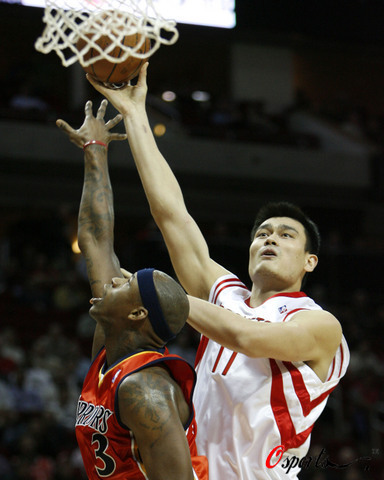 The 36 and 19 were both season highs for Yao in those categories. 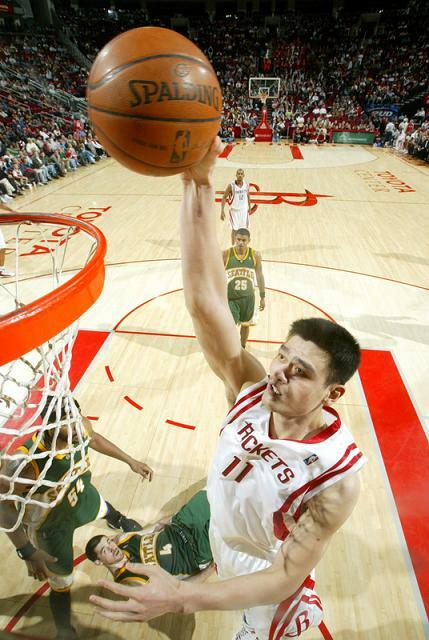 Also remember that this is one game after Yao missed a game with an upper respiratory infection and having to labor through a running team like the Warriors for 40 minutes, including no break from the court in the first quarter and the first couple of minutes of the second. 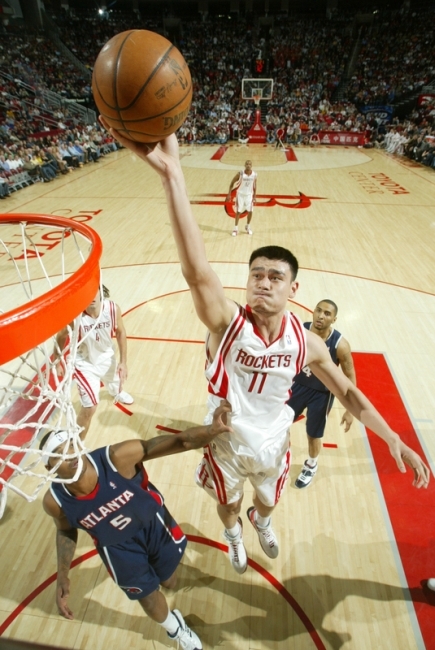 Yao Ming throws down a dunk Monday night against Seattle on his way to 30 points and 17 boards to lead Houston to a victory. Click here for more photos from the game. Having lost to the Philadelphia 76ers last week AT HOME to end Philly’s 7-game losing streak, the Rockets were very close to messing up again against a poor team. The Rockets almost let Seattle snap their own 10-game losing streak after letting them shoot 51% in the first half and let them close within 4 points at 89-85 with 1:50 remaining. But then Houston finally woke up and made the plays they needed to just get by the Sonics. No big field goals were really made by anyone other than Yao taking it strong to the hole on the next possession, getting fouled, and hitting 2 free throws to make it 91-85. The rest of the way the defense stepped up when it had to, and they made 5-of-6 free throws to seal the win. The effort was so bad on the defensive side of the ball, usually passive Houston announcer Bill Worrell said, “The Rockets defense stinks” early in the third quarter after Chuck Hayes was burned on defense, and Worrell lamented how inconsistent their defense was after putting together such a great effort on Saturday against the Spurs. Amen, Bill. 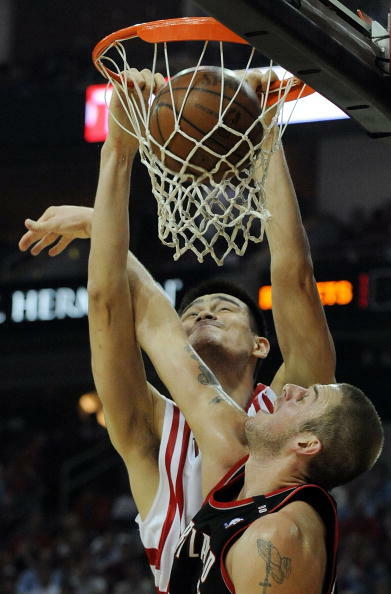 Yao Ming shoots a jump hook in the lane over San Antonio’s Fabricio Oberto in a big win Tuesday night against the Spurs. 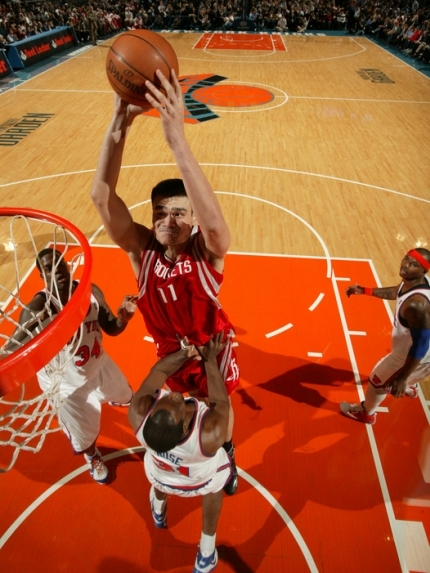 Yao scored 28 points, grabbed 13 boards, dished 6 assists and blocked 3 shots. Click here to see more photos from the game. I said last night after the loss to the Mavs that it would be a rare night when both Mike James and Bonzi Wells had off nights, and not to worry too much. Did that ever ring true Tuesday night when the Rockets beat the Spurs 89-80. Although he was 4-of-13 from the field, James hit some very big shots down the stretch and shot for a pretty good percentage from three-point land (3-of-7). He is turning out to be what the Rockets exactly expected from him: an energy guy who has some speed, can penetrate into the lane, and can hit timely jump shots and three-pointers. Sure, it would be great if he was a Steve Nash-like passer who could find Yao no matter where he was, but wouldn’t it be for everybody? You are currently browsing the archives for the Yao’s best games category.